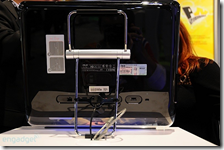 Last October I blog that Asus All In One Eee PC is available in Pre Order in UK and now it seen in action at CES 2009. Here is Pictures taken by Engadget . People are really doing everything to lessen their work. First Touch screen was introduced in Mobile Phone and now almost all Monitor manufacturer are doing their best to bring this technology in Big Screen. 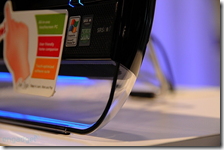 Asus is also trying to compete with other brands that introduceds this one already such as HP Touchsmart. The 15.6-inch touch screen coupled with ASUS’ touch-friendly user interface (having an XP / Atom N270 underpinning) and great design definitely like a winner. 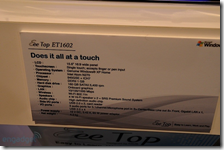 Eee Top will be making in Shipping Stateside in "a few weeks" especially for a $599 ( as per Engadget ). I may not have this amount to buy for this PC but I will definitely check it out when it hit the nearby store. Btw, can I put your blog’s link in my blog? actually I am, I am now blogging for 2 years. Maybe because we are in different niche that is why we have not seen each other in the blogosphere. Actually i’m not really into the touch-screenization(is this a word?) 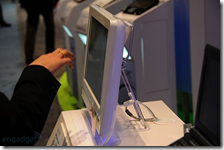 of desktop displays, I think it will make your arm soar if your main input device is the touch-screen. Touch-screens are not ergonomic because it cause a lot of muscle ache on continuous use. Huan22s last blog post..Ubuntu in Mainstream? I believe this touch screen will be best use in your relaxation room. Where you can just point and play any movie and or song that you would like to play.. But in office it will be a big no. Leisure will be the best market strategy for this kind of touch-enabled device. But We do not know maybe when it hit the market it will much cheaper..